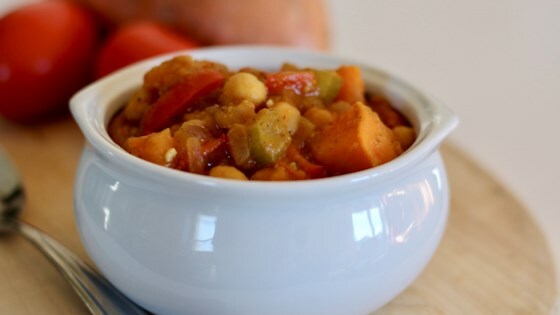 "A perfect blend of rich sweet potato stew with a kick of curry powder and ginger plus the crunch of peanuts." Place sweet potatoes in a microwave-safe bowl and add a splash of the broth. Cook in the microwave until slightly softened, 3 to 5 minutes. Heat olive oil in a soup pot over medium heat. Add onion, celery, bell pepper, and garlic. Cook and stir for 3 to 5 minutes. Add softened sweet potatoes, remaining broth, chickpeas, tomatoes, lemon juice, ginger, cumin, curry powder, coriander, chili powder, salt, and pepper. Bring to a boil, reduce heat, and cover pot. Simmer soup until vegetables are tender, about 20 minutes. Stir raisins and peanut butter into soup and simmer 5 minutes more. Adjust spices if necessary. It was great, made a few changes due to not liking bell peppers and peanut butter. The rest stayed the same, my hubby loved it too.